There are two things about this monitor that grabbed our attention. 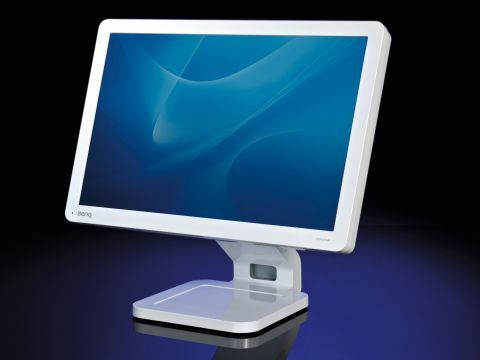 Firstly, its looks: we can't think of a better-looking budget monitor to accompany a Mac mini or white MacBook. The gorgeous white lines, rounded edges and uncluttered detailing are a perfect match. It's a design that could easily have come from Apple. BenQ has even cut a Mac mini-sized raised lip into the base of the FP93VW to cradle the machine. And secondly, the cost: at only £160, it's value for money. We had a few weeks to play with the FP93VW and explore the different connection options and onboard picture quality controls, which are all found on the left-hand side panel. We watched films, typed, surfed around and did some minor graphics editing. latest Mac mini supports display resolutions of up to 1920 x 1200, so this won't be an issue for those owners. The monitor has a very respectable grey-to-grey response speed of 5ms, which helps it display movies and games vividly. This is a budget display, but we struggled to see what had been compromised. Sure, the resolutions and pixel quality could always be better, but unless you're a dedicated graphics worker, those points would be lost on you. And yes, there could be multimedia features, like embedded speakers to bring in some more support for home entertainment, but these kinds of features can also be gimmicky and tend to be blown away by an average set of desktop speakers. No, BenQ has done a very good job here, and gone for a quieter, more sober design that's paid off. The widescreen aspect of 16:10 is comfortable to view, and 19 inches offers a good width and just enough space to have several large windows running side by side. There's no support for HD, though, so you'll have trouble playing HD copyright-protected content. There are two problems with desktop positioning: no height adjustment, and the picture adjustment buttons are hidden out of sight on the left, which makes them fiddly to operate. But, despite minor niggles, we were impressed with this monitor, particularly its image quality. It's a superb mate for a Mac mini that offers good results for the money.